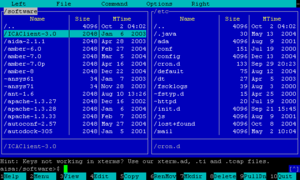 Another kind of TUI is the primary interface of the Oberon operating system, first released in 1988 and still maintained. 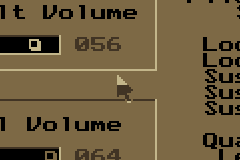 Unlike most other text-based user interfaces, Oberon does not use a text-mode console or terminal, but requires a large bit-mapped display, on which text is the primary target for mouse clicks. Commands in the format Module.Procedure parameters ~ can be activated with a middle-click, like hyperlinks. Text displayed anywhere on the screen can be edited, and if formatted with the required command syntax, can be middle-clicked and executed. Any text file containing suitably-formatted commands can be used as a so-called tool text, thus serving as a user-configurable menu. Even the output of a previous command can be edited and used as a new command. This approach is radically different from both conventional dialogue-oriented console menus or command line interfaces.